One of our focuses of expertise at Evans is on forming and developing High Performing Teams (HPT). A big aspect of high performing teams that makes them stand out from the crowd is the element of trust. There are different things you can do to build trust, such as keep your promises, be honest and ask for feedback, but all of that means nothing without an underlying understanding of safety. We dive deeper into this concept in this Thrive in Five. Imagine a team you’re on currently or a previous team you’ve been a part of. Think of a time when you didn’t agree with a decision or when you made a mistake. Did you feel comfortable speaking up with your concerns or with admitting your mistake? Why did you feel this way? Chances are you either felt safe doing so or you didn’t. Safety is an innate need as a human being. Just look at Maslow’s Hierarchy of Needs. Safety is second only to physiological needs. Often times we think of safety as physical safety. Shelter from weather… free from physical harm… but what does safety mean in a team setting? The key is psychological safety, and without it, you can’t establish trust or have a high performing team. Amy Edmondson’s graph for reaching the Learning Zone – the ideal zone for high performing teams. Frame the work as a learning problem – NOT an execution problem. This creates the rationale for speaking up. Acknowledge your own fallibility. This creates safety for speaking up. Model curiosity – ask questions. This creates the necessity for voice. 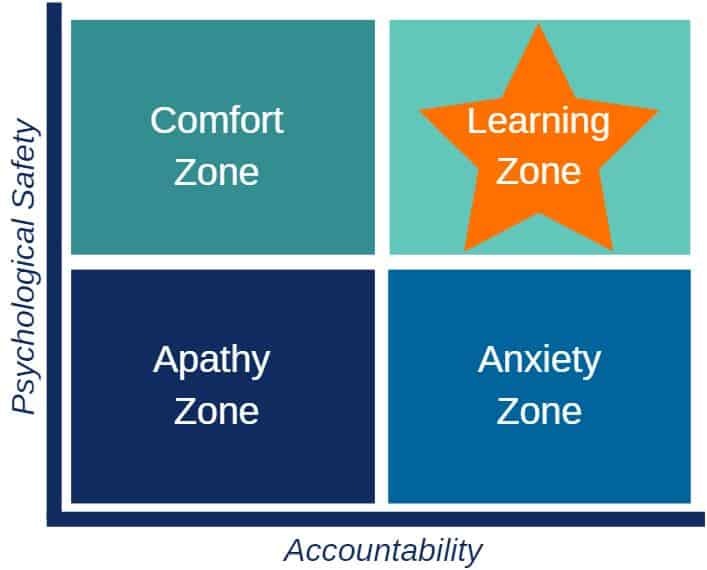 If you are able to implement all 3 practices, you can truly start to develop trust, and bring your team from the comfort zone, apathy zone, or anxiety zone into the learning zone. Amy Edmondson has a great 11.5 minute TED Talk about psychological safety. If you’re interested in learning more about her research and findings, you can watch the talk below. The first step to improvement is self-awareness and acknowledgement that there is room to improve. For this Thrive, all we ask is for you to increase your awareness of the psychological safety of your environment. Luckily for all of us, Amy Edmondson also created a psychological safety self-assessment with a total of 11 questions. It’s quick and easy, and the higher the rating, the better your team’s psychological safety! Click below to print! I once held a Project Manager role which required significant communication between my team and the Stakeholders. My manager gave us little direction for how to approach our client counterparts, so our team brainstormed how to properly provide support for them. Our solution was simple – establish trust early. As a consultant, you want the Stakeholders to understand they can look to you for support. Therefore, our team developed trust with the client early on in our young project through great performance and personal relationships. The parental relationship is one where trust is a huge factor. 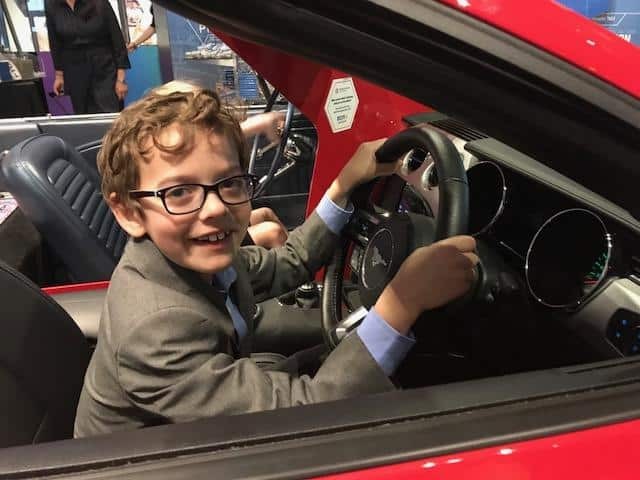 I think our kids, our oldest Oliver shown here, are great proof for the awesome team my wife and I make! I’ve found this lesson critical for any facet of life. In 2009, my wife and I found out we were expecting our first child. As incredible a feeling as that was, we were scared (and not just because we found out immediately after seeing Paranormal Activity). We had no idea how to raise a child, but we knew we had to trust in the strength of our relationship to be the best parents as possible. Now we are the proud parents of Oliver (8) and Ariel (6)! I’ve also been a member of various bands (guitar, drums, bass, singing, etc. ), and whether we’re writing songs or performing on stage, trust in my band mates has always been crucial for our progression. As you can see from my experience, success begins with trust in others and in yourself for your professional career, personal life and your hobbies.